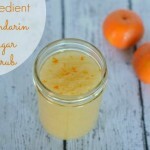 This homemade Mandarin Sugar Scrub Recipe is part of a sponsored campaign on behalf of Halos. As always, all opinions are my own. With the holiday shopping season in full swing, it’s often tempting to go the store bought route when purchasing Christmas gifts. But unless you know exactly what someone wants there’s no guarantee that they need or will even like what you give them. I know it’s the thought that counts, but everyone wants the recipient to really enjoy their gift. Personally, nothing is more perfect or feels more personalized than a homemade gift. It’s also these homemade gifts that are also the most memorable. My daughter’s homemade ornaments and cards are some of my favorites, but homemade goodies like soup mixes, baked goods, and photo albums are also great items to give and receive. For one of my girlfriends that has it all, I decided to make a homemade gift using items I already had in my kitchen. 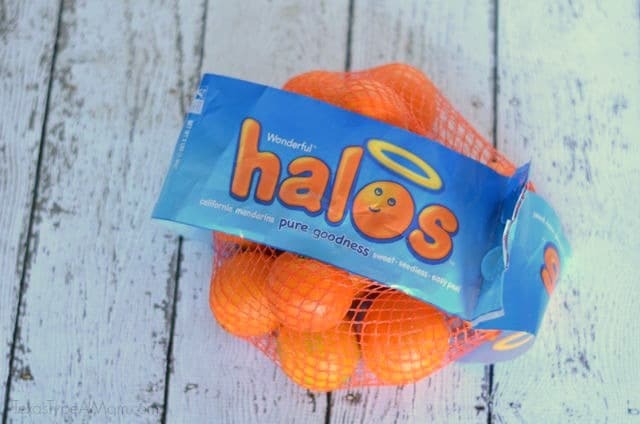 One of the fruits that I always have on hand during the holiday season are Halos mandarin oranges. They’re healthy, taste amazing, and are so easy to peel making for a perfect breakfast or snack on the go. So, with just 3 simple ingredients I quickly whipped up this wonderfully effective and divine smelling homemade Mandarin Sugar Scrub! Super simple, 3 ingredient sugar scrub! Squeeze Halos mandarin oranges over sugar and stir with a spoon to combine. Add room temperature coconut oil to the mix. By room temperature, I mean that it needs to be in the liquid form. Mix all ingredients together and transfer to a 12 ounce canning jar. You can also add ribbon, scrapbook paper cut to size, or a label to finish off your scrub. It took less than 5 minutes from start to finish to complete the mandarin sugar scrub. 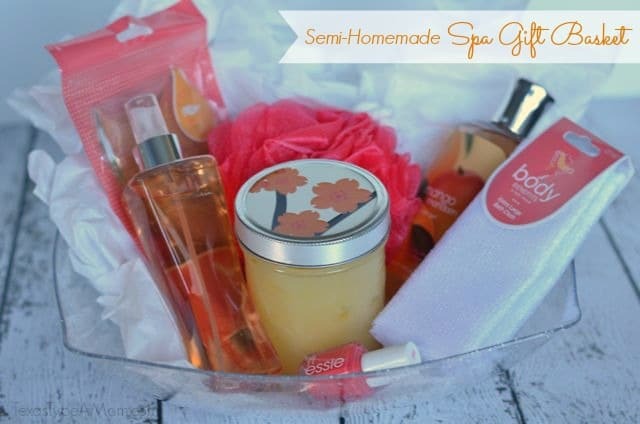 I added this homemade touch to a collection of other items and create a spa gift basket. While it’s not the traditional colors of Christmas, this would be a perfect gift for that special woman in your life! Have you tried making your own beauty products before? What’s your favorite gift to give or receive? 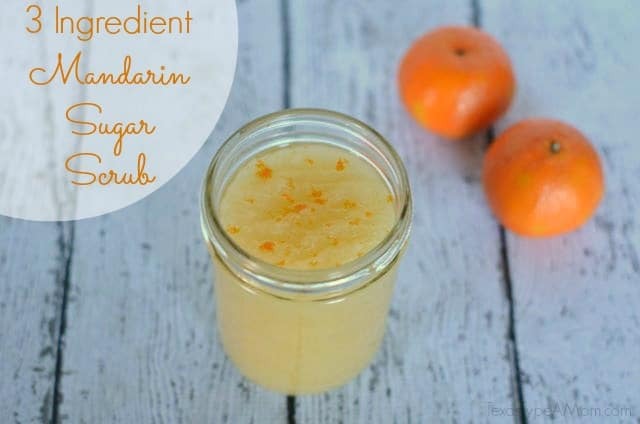 If you enjoyed this mandarin sugar scrub recipe, you’ll love this Peppermint Sugar Scrub, Mint Chocolate Sugar Scrub, Grapefruit Sugar Scrub, and Lavender Vanilla Sugar Scrub recipe. That’s so easy and what an awesome gift idea this would make!! I love it. Is it wrong that I kind of want to eat this too? 🙂 I bet it smells amazing! I have never made my own, but didn’t realize it was so easy. I love that the scents could be changed up as well, but I bet that orange smells fantastic! I think I’m going to make these tomorrow for a quick DIY teacher gift! This seems VERY easy and looks great! I may have to try this as I love the scent of oranges. Such a great idea, I love the smell of mandarin oranges! I have all these ingredients and going to make this! You can’t go wrong with the mandarin smell either! What a great gift! I love how simple that recipe is! I can practically smell it now – what a great gift idea! Love it. I love the smell of anything with oranges. So I’m sure I would love this. As an added bonus, it is easy to use. Nice! I never realized how easy it was to make sugar scrub! can I just eat it instead? LOL. on a more serious not this is a great homemade scrub! woooo this sounds and looks good! would love to have this for breakfast now!! I buy mandarin oranges a lot, because I love to eat them. I’ll definitely have to try making this scrub. I bet it does wonders for the skin! I love sugar scrubs. This one sounds absolutely wonderful! What a wonderful idea, I bet it smells like pure bliss! Ooh I bet that was an invigorating smell! This sounds super easy to make and I bet it smells ah-mazing, too! WOW that looks so incredibly easy and simple to make! Think I might have to do a mini spa night with my daughters and this recipe. Sugar scrubs are so easy to make and wonderful to give as gifts (I mean what woman doesn’t like to pamper herself a bit?) — the great part is, whatever doesn’t fit into the gift jar is all yours!!!! 🙂 Happy New Year to you! I have all the ingredients at home! I will try this tomorrow! This has to be the easiest sugar scrub recipe I’ve found. I have the coconut oil and the sugar – I guess I’m going shopping for mandarin oranges tomorrow! Great idea, thanks for sharing this. Do you have any suggestions for other oils that can be used other than coconut?